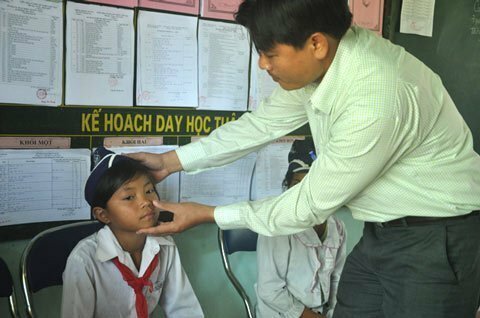 VietNamNet Bridge – While the bizarre skin disease in Ba To district in the central province of Quang Ngai is still a mystery, a new skin disease has appeared in the province’s Son Ha district, affecting dozens of students. According to local newspapers, tens of students in Son Ha district have contracted this disease, which caused their skin to turn dark. Mr. Luong Ngoc Khue, chief of the Ministry of Health’s Medical Examination Agency, says that he heard the information from the local media and it has not been verified by relevant agencies. Meanwhile, Dr. Tran Hau Khang, director of the Central Dermatology Hospital, says that he has examined some patients and found out that this is not an unknown disease, but a rare disease. The disease appears when patients contact with some substances that are sensitive to sunlight. Last week Minister of Health Nguyen Thi Kim Tien paid a visit to Quang Ngai to work with local authorities about the bizarre skin disease. Earlier, experts announced that 14 out of 26 blood samples of patients are positive to Ricketsia virus. However, it is not defined as the major reason that causes the strange skin disease. Until now, the disease is still a mystery.